Performance, style, economy, efficiency and versatility – the Peugeot 308 is the one car which has it all. The 2014 European Car of the Year winning compact family hatchback is the perfect choice if you’re considering a new ‘65-plate’ model from 1st September. Over 22,000 have been sold in the UK since the car was launched 18 months ago and its striking design has been key to that success. The 308’s sleek exterior gives the car a genuine contemporary presence on the road, though it’s the beautifully executed cabin that has stolen the hearts from many discerning drivers. The premium Peugeot ‘i-Cockpit’ interior is a real game-changer for Peugeot. Driver-focused and minimalist, like nothing else in the segment, it offers a state of the art 9.7-inch touchscreen which takes in-car infotainment to a high level. The beating heart of the 308 is its range of ultra-efficient PureTech petrol and BlueHDi diesel engines. Mated to a choice of advanced manual or automatic transmissions, the result is exceptional environmental performance, no matter which model is chosen. Combined Cycle fuel economy is as high as 91.1mpg with CO2 emissions as low as 82g/km – figures with mouth watering appeal to both retail and corporate customers. For drivers seeking extra practicality for families or larger loads, the 308 SW makes an excellent ‘head and heart’ choice. Its generous boot space is among the best in the segment with an impressive 660 litres below the parcel shelf, including 70 litres hidden under the boot floor for extra security. ‘Magic Flat’ rear seats are standard and the ‘instant folding’ system – available thanks to levers accessible on both sides of the boot – is simple and intuitive to use. For outstanding versatility, it creates a flat floor and a massive 1,660 litres of luggage space. With prices starting from only £14,995 for the hatchback, there’s a Peugeot 308 for every customer. The high level of standard equipment across the range includes DAB digital radio, air-conditioning, remote central locking and cruise control. From Access trim, through Sportium, Active and Allure, the specification is a desirable mix of comfort, convenience and technology. Broadening the range further, the 308 GT adds a touch of performance, with the choice of a 1.6-litre e-THP 205 manual, or 2.0-litre BlueHDi 180 automatic under the bonnet. The 308 GT is supported by the 308 GT Line, which features much of the look of its sporty sibling but with a wider range of economical engines. The letters ‘GTi’ have long been associated with Peugeot performance and after a triumphant unveiling earlier this summer at the Goodwood Festival of Speed, the flagship 308 will soon be in Dealerships. Developed by Peugeot SPORT, it’s designed to offer a thrilling and unparalleled driving experience with power outputs of 250hp and 270hp. It will be available on a 65-plate from November. 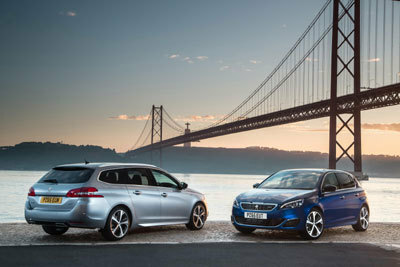 Paying for your new 65-plate Peugeot 308 couldn’t be easier. Passport finance is ideal for customers who like to change their car every three years, and means fixed monthly payments for simple budgeting. For example, you can drive away a new Peugeot 308 Active 1.2-litre e-THP 110 S&S (RRP £18,065), with a deposit of £2,840 and 36 monthly payments of just £225. That includes a Peugeot incentivised deposit contribution of £700.